In retrospect, Loomis, Fargo & Company were wise to rebrand themselves as simply “Loomis.” The armored car service was indeed formed by the merger of Loomis Armored and Wells Fargo Armored Service, the last vestige of the storied Wells Fargo express shipping company. Although they shared the same roots, they had been divorced from the currently embattled banking firm since 1905. As Loomis-Fargo, the company experienced some equally awkward image problems, but in their case it was as the victim of a crime. The bizarre 1997 heist gets played for laughs in Jared Hess’s Masterminds (trailer here), which opens today nationwide. Believe it or not, this goofy caper fully stocked with SNL alumni is pretty darned faithful to the North Carolina armored car robbery (not to be confused with the Florida Loomis Fargo robbery seven months prior—it was a tough year for the company). David Scott Ghantt really was a shaggy dog with puppy eyes for his former co-worker Kelly Campbell. Working in cohort with her friends Steve and Michelle Chambers, Campbell seduces the pliable Ghantt, convincing him to empty the Loomis Fargo vault one night. The plan is for the Chamberses to hold the money, periodically wiring sums to Ghantt in Mexico as he waits for the heat to blow over. Unfortunately, the FBI immediately zeroes in on the absent Ghantt as their prime suspect. Realizing their fall guy knew more about him than he had bargained for, the extravagantly spending Chambers dispatches contract killer Mike McKinney to permanently silence Ghantt. Up to this point, Masterminds is way more faithful to the historical record than your average Oliver Stone movie. It starts to take liberties in the increasingly farcical third act, but it is still close enough for government work. Equally surprising, the chemistry developed by Zach Galifianakis’s earnest Ghantt and Kristen Wiig’s instantly remorseful Campbell is rather sweet and appealing. In contrast, the bromance he shares with Jason Sudeikis as the would be hitman is neither believable or funny. Owen Wilson delivers a few nicely barbed lines as Chambers, but he is mostly stuck doing thankless heavy work. Fortunately, Hess understands a little of Leslie Jones’ tough talking shtick goes a long way, so he uses her sparingly as the lead FBI agent. 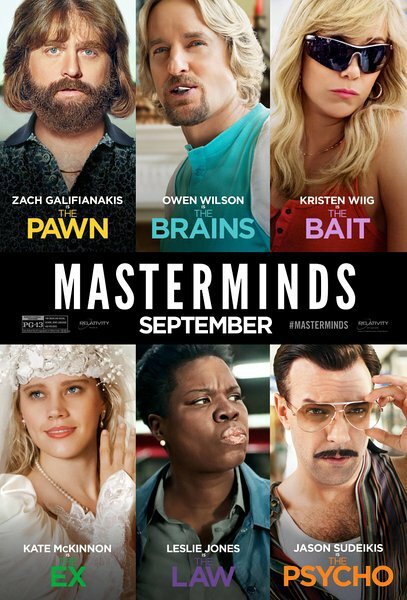 Although not exactly a new classic, Masterminds is an amusing film that ambles along at a pleasant pace. Frankly, it is rather mind-blowing how little the battery of screenwriters (Emily Spivey, Chris Bowman & Hubbel Palmer) embellished from the documented record. Recommended as a low-stress, low-impact comedy caper, Masterminds opens nationwide today (9/30), including the AMC Empire in New York.